Many people are working to understand why pitchers are injured. The hope is that this knowledge can help us understand how to drive down the rates of injuries that pitchers experience. The thing to pay attention to is the fourth figure from the left, which is labeled "Maximum External Rotation". Notice how the figure's Pitching Arm Side (PAS) forearm is vertical and pointing upwards as if he was giving someone a "high five". The problem with this representation is that it's not what you see -- and isn’t even physically possible -- in a high-level throw. As the photo above of Roger Clemens demonstrates, in a high-level throw you will see 180 or so degrees of external rotation in the Pitching Arm Side upper arm at this moment in time, not the 90 degrees of external rotation that is shown in the fourth figure in the diagram above. The representation of the fourth figure may represent a common misunderstanding of the nature of a pitcher's arm slot. As I explain in my piece The Great Arm Slot Myth, many people believe that a pitcher's arm slot is determined by the amount of flexion or extension (or, more simply, bend) in the elbow at the release point. 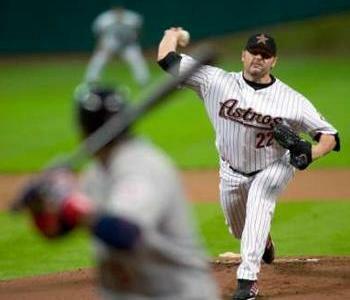 The truth is that, due to centrifugal force, every pitcher's elbow is fully extended at the release point. As a result, a pitcher's arm slot is determined by the amount of shoulder tilt, and not the angle of the elbow, at the release point. 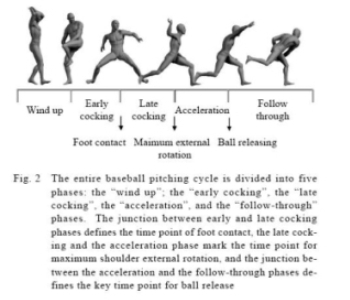 Another obvious problem with the commonly-accepted baseball pitching cycle is the placement of the start of the acceleration phase. 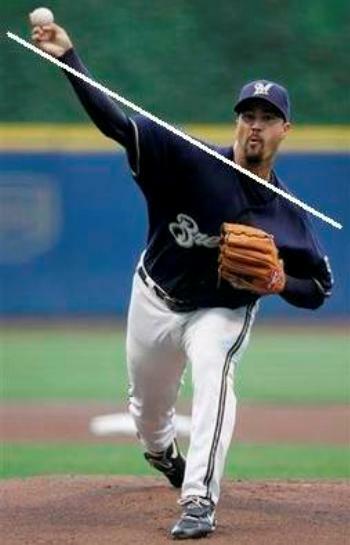 In many of the baseball pitching cycle diagrams that have been used in various journal articles, such as "Valgus Torque in Youth Baseball Pitchers: A Biomechanical Study" by Sabick et al in the May/June 2004 edition of the Journal of Shoulder and Elbow Surgery, the start of the Acceleration phase is set as the point of maximum external rotation. The problem with setting the start of the Acceleration phase at this moment in time is that in truth most of the acceleration of the pitcher's shoulders has been completed by this moment in time. In fact, the point of maximum external rotation is usually considerably nearer to the moment where the deceleration of the shoulders begins than when the acceleration of the rotation of the shoulders begins. It is also inaccurate to break up the Late Cocking and Acceleration phases into two separate phases due to the fact that it is the acceleration of the rotation of the shoulders that causes the activity that is observed during the Late Cocking phase (e.g. the external rotation of the Pitching Arm Side upper arm and the laying back of the Pitching Arm Side forearm). In other words, the Acceleration phase actually starts during what is currently being labeled as the Late Cocking phase. Finally, the delineation between the Early Cocking and Late Cocking phases is at least quite subtle and often quite arbitrary. More importantly, the differences in a pitcher's arm action and when and how they transition from Early Cocking to Late Cocking may have important injury implications. As a result, it is best to not put a break point in the sequence at this moment in time out of fear of disguising potentially relevant information. Representative of true phase/stress changes. Most significant to the health of a pitcher's arm. The goal is to clear up the numerous misconceptions that exist about what pitchers' arms actually do as they throw the ball. I will do this using video of a student of former St. Louis Cardinals pitcher Greg Mathews. It was estimated by Mathews that this pitcher was throwing 80 MPH. The Preparation phase of the Revised Baseball Pitching Cycle begins with the movement of the pitcher's Glove Side (or stride) foot and concludes at the top of the leg lift. This is because, while the Wind-Up and Set are two different initial positions and sets of preparatory movements, they both end up with the pitcher at the top of the leg lift (although the height of the leg lift will often vary depending on whether the pitcher goes from the Wind-Up or Set position). I have labeled this phase the Preparation phase, and not the Wind-Up phase as has been done in the past, because the Wind-Up is a discrete and defined set of preparatory movements that are quite different than the movements that you see when a pitcher starts from the Set (aka Stretch) position. Preparation is a more neutral term that takes into account throws that start from both the Wind-Up and Set positions. The Stride phase of the Revised Baseball Pitching Cycle begins at the top of the leg lift and concludes with the planting of the GS heel. I chose this point in time as a phase break because pitchers' mechanics are largely the same, regardless of whether they go from the Wind-Up or the Set (aka Stretch) positions, from the top of the leg lift onward. The Acceleration phase of the Revised Baseball Pitching Cycle begins with the planting of the heel of the Glove Side foot and ends at ball release. The planting of the heel of the GS foot is an important point in time because in most (c. 90%) cases the rotation of the shoulders, and thus the acceleration of the pitching arm, starts with the planting of the heel of the GS foot. In a high-level throw, at the start of the Acceleration phase the pitcher’s hips have opened on average 15 to 30 degrees (and in rare cases, like Tim Lincecum, 45 to 60 degrees) while their shoulders are still closed and have not started rotating. In other words, a high-level pitcher’s hips rotate ahead of their shoulders. This stretches the muscles of the Core and, because of the Stretch-Shortening Cycle, increases the force with which the muscles of the Core can contract. At the start of the Acceleration phase, when the pitcher is at what is commonly referred to as the High-Cocked or Power Position, the Pitching Arm Side (PAS) upper arm is generally abducted between 80 and 90 degrees and is externally rotated between 75 and 90 degrees. However, in some cases at the start of the the Acceleration phase you will see significantly more abduction of the PAS upper arm and significantly less external rotation (ER) of the PAS upper arm (sometimes 0 degrees of ER or in rare cases even a fair amount of Internal Rotation). As the Acceleration phase begins and the pitcher’s shoulders start to rotate, the Pitching Arm Side upper arm externally rotates an additional 90 (or in rare cases, like Billy Wagner, more) degrees. The amount of external rotation that occurs during the Acceleration phase depends in part upon the amount of external rotation at the start of the Acceleration phase, which can vary widely from pitcher to pitcher. Because there is so much, possibly significant, variability in the positions of pitchers' arms with respect to external rotation during this phase, in my opinion it is preferable to simply label this phase the Acceleration phase and not subdivide it into the Early Cocking and Late Cocking phases. That is because while the amount of external rotation at the moment the GS foot will vary widely, and possibly significantly, from pitcher to pitcher, in most cases the planting of the GS foot will begin the rotation of the shoulders. The Deceleration phase of the Revised Baseball Pitching Cycle starts at ball release and ends when the pitcher's arm has decelerated fully. A pitcher's follow-through does have some injury implications because it is generally accepted that the longer the follow-through, the longer the arm has to decelerate. As a result, less force must be exerted by the muscles in the back of rotator cuff at any point during the follow-through. The Recovery phase of the Revised Baseball Pitching Cycle starts when the pitcher's arm has decelerated fully and then rebounds. It also encompasses the pitcher's movements to get ready to field a batted ball. How a pitcher recovers from a throw does have some injury implications because the way that a pitcher recovers from throwing the ball impacts how they are able to respond to a ball that is hit directly at them (aka a "come-backer"). For example, a pitcher who recovers with their glove sticking out behind them and toward Second Base will obviously be less able to defend themselves than will someone who finishes with their glove closer to their Glove Side chest. 1. Hwai-Ting Lin, Fong-Chin Su, Mari Nakamura and Edmund Y. S. Chao. COMPLEX CHAIN OF MOMENTUM TRANSFER OF BODY SEGMENTS IN THE BASEBALL PITCHING MOTION. Journal of the Chinese Institute of Engineers, Vol. 26, No. 6, pp. 861-868 (2003).